Eddie Cantor was a huge star of vaudeville, Broadway, old-time radio, silent movies, and talkies. He was awarded an honorary Academy Award in 1956 for distinguished service to the film industry, in a long career that spanned three decades and such memorable films as Special Delivery, Kid Boots, Whoopee!, and Roman Scandals. One of his earliest paying jobs was as a singing waiter, with Jimmy Durante accompanying him on piano. Florenz Ziegfeld hired him to appear at his rooftop postshow, Midnight Frolic, in 1917. A year later Cantor made his Broadway debut in the Ziegfeld Follies of 1917, often appearing in blackface in an era that popularized Will Rogers, Fanny Brice, and W. C. Fields. After appearing on Broadway for years, he moved into radio in the 1920s. In 1931 he starred in an hour-long Sunday evening variety series that established him as a leading comedian. He also discovered and helped guide the career of singer Dinah Shore, first featuring her on his radio show in 1940, as well as other performers, including Deanna Durbin, Bobby Breen, and Eddie Fisher. Cantor also had a huge song hit in 1934, "Santa Claus Is Coming to Town", which sold 400,000 copies by Christmas of that year. Cantor capitalized on the 1929 stock market debacle by writing highly popular best-selling books of humor and cartoons about his experience, including Caught Short! A Saga of Wailing Wall Street in 1929. 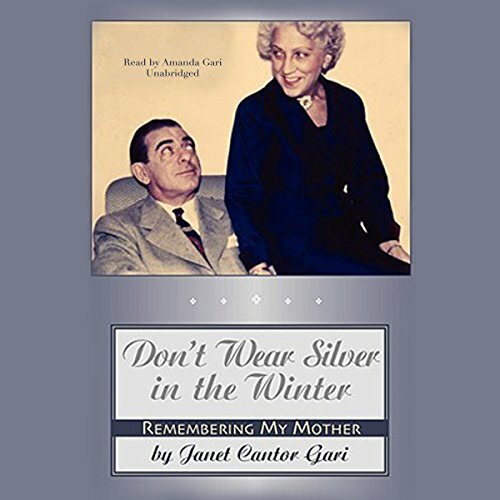 You can imagine how often Janet Cantor Gari heard that her mother was inadvertently as funny as her father, the legendary Eddie Cantor, and that she ought to write a book. The result was surprising, even to herself, as she uncovered her true relationship with her mother. Whether Janet is describing situations in her native New York or the nine years she lived in Hollywood, the book is completely candid. You'll casually meet celebrities under circumstances you'd never expect, and you'll empathize with the Cantor clan's triumphs and tragedies as if you were a next-door neighbor!